The Original Brew Jeans with a blank patch. Let yourself be simple. No frill, no fuss. This one is for all those low maintenance people out there. 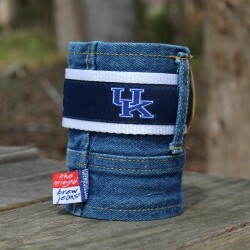 The Original Brew Jeans koozie is a high quality denim, neoprene-lined beverage cover to keep for favorite drinks frosty cold. They are designed to fit all standard 12 oz cans and 16 oz bottles with ease.